As if the trailer restoration wasn't enough, I decided to do a basic restoration of the Unisaw I picked up a couple months ago in a surplus auction. 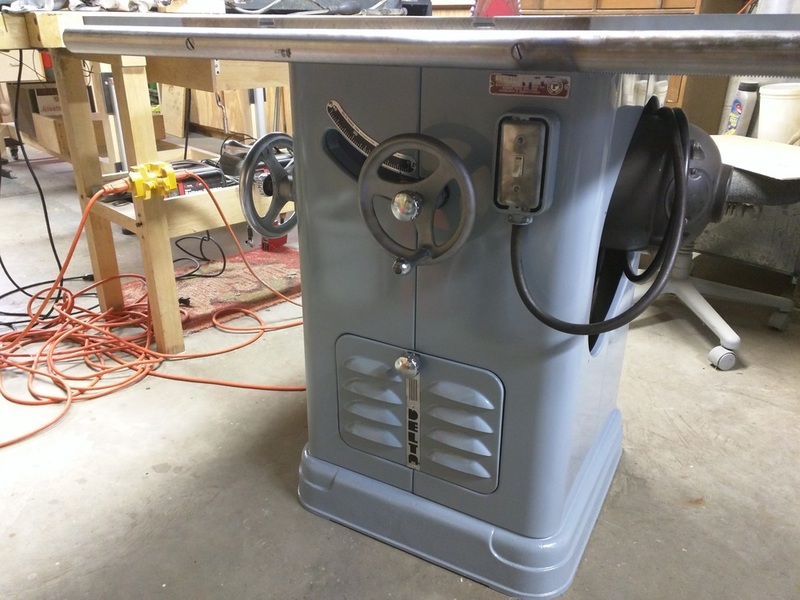 This saw will become my main (and only) table saw in the shop. I sold my old Jet contractors saw recently, so I really needed to complete this. I have a number of woodworking projects waiting, not to mention all the cabinet work for the trailer that will be coming soon, thus the urgency to get this done. 1965 Rockwell Delta Unisaw - 1.5hp, 110/220 (wired for 110). The saw was in good shape considering it's age. The motor runs strong and quiet, and all the mechanicals were tight, just needed cleaning up. I tore it completely down and blasted a number of the cast pieces, including the base. Stripped the cabinet to bare metal and repainted everything. I didn't take many pictures of the tear down as I didn't plan on making a full post about the restoration. But, after the fact, I thought it would be fun to show some before and after shots. I took the pics below as documentation for myself to use as a guide when I went to reassemble it. All the mechanics blasted, repainted, and awaiting re-assembly. After a bit of swearing (ok, maybe a lot) and great help from Toni to figure the best plan of attack, the guts are back home. I'm really happy with how this turned out. I was able to tune the table/blade alignment to within a tick on the dial indicator over the full blade width. The first few test cuts were smooth and clean. The only issue I ran into is the rails are slightly bent, so moving the fence at the max width is a bit sticky. I tried bending them back and did get them close, but not perfect. I plan to replace the rails and fence soon, so not too concerned. Now I'm fully armed and ready for the long line of woodworking projects I've got on my list.